FLYING TIGER shares a common aim to provide cutting-edge textile technology at an affordable price in tandem with responsive service support to provide efficient, reliable and value-added solutions in the production of top quality textiles. As a main component, the needle bed is processed by a sequence of advanced facilities : cutting, milling, quenching, computerized temperature-controlled cleaning machine and CNC machine. This particular milling machine is completely developed and built in-house specifically for own purpose to ensure optimum level of precision, and consistency. 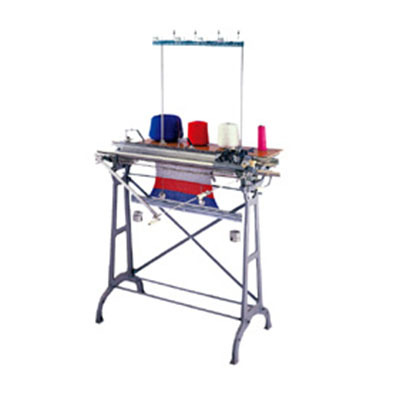 The world-class quality of FLYING TIGER machine is the pride of its industry. Operated with low bult needle.To correspond to the five-pitch.Racking devices and position.The adjustable center cam. This enables a variety of knitting structures such as plain, full Milano rib, cable, and half milano stitch patterns. Three kinds of needles are applicable to both needle beds to correspond to adjustable-center cam. lower cam and five-pitch racking devices in both sides. This allows various knitting structure patterns to be produced, such as tucking,Racked fully cardigan stitching. The new cam system allows FT2000 manual machine to perform shaping by holding method. Selected needles are put out of action for stitch holding, and are brought back to action with the center cam at any time. Suitable for knitting shaped collars. V-neck, crew-neck, and set-in sieves.Simple jacquard patterns is possible. Due to continuous improvement, all product specifications & appearance are subject to change without prior notice.